Over the last 11 years, Jay Drury, has lead the Pride of West Virginia with class, pure joy and love. On June 1st he will step down as Director and resign from the band. “Words cannot express the great honor it has been for me to serve this band program, my Alma Mater and the great state of West Virginia over the past 19 years. “Although my love for and dedication to this program have not waivered, the time has come for me to focus more on my family as I look to continue to serve WVU and the state of West Virginia in a new way," Drury said. The Pride is one of the premier band programs in the country and during his tenure the band not only achieved excellence on the field, they also achieved excellence off of it while travelling all across the country. 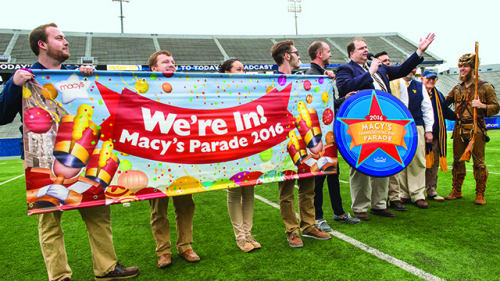 This past November he lead the band in the Macy's Thanksgiving Day Parade which was celebrated as a major moment in the history of the state of West Virginia. To say that the state was proud of the band is an understatement. It was historic. Drury lead the band to 11 bowl appearances, basketball tournaments across the country, Disney World and Universal Studios and to the U.S. Capitol in Washington D.C. However, the best way to gauge a band director's success and impact is by hearing about how they changed the lives of students. When the resignation was announced, countless alumni and current band members took to social media to show their love and support for Drury. The hashtag #AllHailJay quickly spread across twitter. It is clear that Drury not only made the Pride of West Virginia better, he made the people in the band better. That is his legacy. That is his impact and that will forever be how he is remembered. So Jay, as you begin this new adventure in your life may we remind you of the two words you have told so many members of the Pride: Be Brave.